Are you the proud owner of a new lawn? If so this lawn and gardening tip will be invaluable to you. Actually though, the 'tip' itself is broken down into the three main elements in lawn care - watering, mowing the grass and traffic (not cars but human traffic). It is crucial your new lawn should be watered every day during the first few weeks. By watering daily you help ensure the grass roots become firmly embedded. 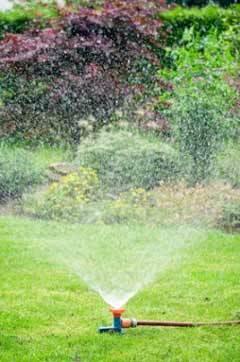 If you live in a dry area or are suffering a drought, twice a daily watering may be necessary to keep your new lawn in good condition. To ensure your new lawn remains healthy, it needs to be kept moist, but over-watering will cause problems as the grass will become sodden and muddy. Do not water the grass so much that pools appear on the surface. Over-watering can also prevent the grass roots embedding themselves properly in the soil. One sign that the grass is not getting the water it requires is when it begins to turn a greyish colour. To check if the lawn is adequately watered, just dig a knife or screwdriver into it. If you can reach a depth of six inches the new grass is retaining enough moisture. After two weeks your new lawn should only need watering two to three times weekly. But the local environment could determine how often you need to water. Lawns in dry areas, or in a location which is suffering a drought, may need to watered up to five teams a week initially. 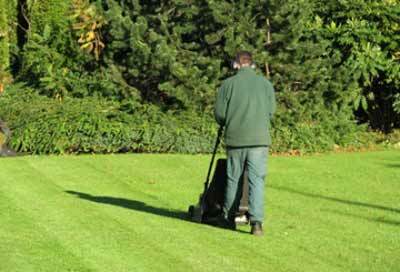 Newly released guidelines on lawn garden care of newly laid lawns claim that the grass can be cut within three weeks. The advice for lawns that have been seeded takes the duration before it is safe to mow up to eight weeks. It is also important that you only mow the new lawn when the grass is dry. If you perform a cut when it is wet, the new grass could be pulled out of the soil by its roots. Your new lawn should not be "scalped" or cut too low. It is better that you let the newly grown grass grow too long rather then be too short. That allows the grass to take firm root before being buffered by your motorised lawn mower. Traffic on your new lawn includes children riding their bikes or playing on it. This should be avoided as much as possible for the first few weeks. If a new lawn suffers a lot of this kind of traffic it could deteriorate severely and die. Extreme wear and tear will damage the grass roots before they become well embedded. So it is important to keep any traffic off the new lawn if at all possible though if you have children and / or pets I don't really fancy your chances of keeping that nice new lawn traffic free. Note: We'd love you to send us your favorite garden pics to feature on our new pages!